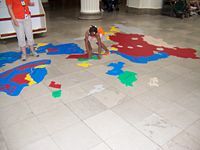 A child learning the countries of Asia by experience rather than by rote learning. Experiential education (or "learning by doing") is the process of actively engaging students in an authentic experience that will have benefits and consequences. Students make discoveries and experiment with knowledge themselves instead of only hearing or reading about the experiences of others. Students also reflect on their experiences, thus developing new skills, new attitudes, and new theories or ways of thinking. Experiential education is related to the constructivist learning theory. Experiential education changes schools because it requires new roles of students, teachers, and administrators. It can provide a different, more engaging way of treating academic content through the combination of action and reflection. Experiential education empowers students to take responsibility for their own learning. It can also provide a process for helping all those involved in schooling become more comfortable with the unfamiliar roles commonly proposed for restructured schools. While experiential education has proved itself of value in many situations, it cannot replace all forms of education. Human beings are able to learn from others, without having to repeat every discovery on their own. Equally, applying experiential learning without a clear understanding of the conceptual basis, for example by simply having students be physically active without ensuring that they are cognitively processing the information has little benefit in learning. For some types of learners, and some types of material, the active learning experience may be the optimal teaching method; for other types of learners and other types of material, however, the more traditional academic methods still have their place. A balance between different methodologies is needed to ensure the best learning opportunity for all. Experiential education is a philosophy of education that focuses on the transactive process between teacher and student involved in direct experience with the learning environment and content. The term is mistakenly used interchangeably with experiential learning. The Association for Experiential Education regards experiential education "as a philosophy and methodology in which educators purposefully engage with learners in direct experience and focused reflection in order to increase knowledge, develop skills and clarify values." John Dewey was the most famous proponent of experiential education, perhaps paving the course for all future activities in his seminal Experience and Education, first published in 1938. Dewey's fame during that period rested on relentlessly critiquing public education and pointing out that the authoritarian, strict, pre-ordained knowledge approach of modern traditional education was too concerned with delivering knowledge, and not enough with understanding students' actual experiences. Experiential education differs from much traditional education in that teachers first immerse students in action and then ask them to reflect on the experience. In traditional education, teachers set the knowledge to be learned (including analysis and synthesis) before students. They hope students will subsequently find ways to apply the knowledge. Dewey's work went on to influence dozens of other influential experiential education models and advocates, including Foxfire, service learning, Kurt Hahn and Outward Bound, among others. Paulo Freire, a Brazilian educator and the father of modern critical pedagogy, is often cited in relationship to experiential education. Freire was largely focused on the active involvement in students in real experience, radical democracy, and the creation of praxis among learners. Despite the efforts of many efforts at progressive educational reform, reports by researchers such as Goodlad (1984) and Sizer (1984) suggest that most teaching, particularly at the high school level, still involves the teacher as purveyor of knowledge and the student as passive recipient. In Democracy and Education, John Dewey attempted to synthesize, criticize, and expand upon the democratic or proto-democratic educational philosophies of Rousseau and Plato. He saw Rousseau as overemphasizing the individual and Plato as overemphasizing the society in which the individual lived. For Dewey, this distinction was, by and large, a false one; like Lev Vygotsky, he viewed the mind and its formation as communal process. Thus, the individual is only a meaningful concept when regarded as an inextricable part of his or her society, and the society has no meaning apart from its realization in the lives of its individual members. However, as evidenced in his later Experience and Nature, Dewey recognizes the importance of the subjective experience of individual people in introducing revolutionary new ideas. Carl Rogers made significant contributions to the field of education with his theory of experiential learning. He maintained that all human beings have a natural desire to learn. Therefore, failure to learn is not due to the person's inability to learn, but rather to problems with the learning situation. Rogers defined two categories of learning: cognitive (meaningless) learning, which involves academic knowledge, such as multiplication tables, and experiential (significant) learning, which is applied knowledge, such as how to repair a car. The key distinction is that experiential learning addresses the needs and wants of the learner, and thus has the qualities of personal involvement, self-initiation, self-evaluation, and long-lasting effects. when students are required to use self-evaluation to assess their progress. Experiential education, or "learning by doing," is the process of actively engaging students in an authentic experience that has benefits and consequences. Students make discoveries and experiment with knowledge themselves, instead of hearing or reading about the experiences of others. Students also reflect on their experiences, thus developing new skills, attitudes, and ways of thinking. Experiential education empowers students to take responsibility for their own learning. Whether teachers employ experiential education in service learning, environmental education, or more traditional school subjects, it involves engaging student "voice" in active roles for the purpose of learning. The caveat in the experiential learning situation is that while the content of much of what we need to learn is desirable and amenable to the experiential approach, there are many things that people, especially children, may not want to learn, but are necessary in order to function fully as adults in human society. Allowing children to decide that certain "meaningless" knowledge need not be learned, reduces the job of teachers to mere supports in their students' learning process, taking away their role in guiding education to fulfill the larger purpose determined by society. The efficacy of active instructional techniques has been questioned by several researchers. Certainly practicing procedural skills is a necessity for learning to be automated. But while these activities may be motivating for learners, unguided situations can in fact leave learners less competent than when they began the activity. Should practice happen before, or even during initial learning? Unfortunately, some instructors develop unguided course activities and expect novice learners to learn from these experiences. Those promoting ‘Active learning’ strategies assume learners need little guidance. However, guidance is a necessary part of instruction, and provides a more efficient learning experience for novice learners. Self guided instruction may be arduous and clumsy, and often less than efficient. Sweller suggests learners should study worked-examples because this is a more efficient method of initial instruction, finding that learners who studied worked examples performed significantly better than learners who actively solved problems. This was later called the "worked example effect." It relies upon strong guidance from the instructor, as opposed to the minimally guided situations, often found in "active learning" based instruction. Whether teachers employ experiential education in cultural journalism, service learning, environmental education, or more traditional school subjects, its key idea involves engaging student voice in active roles for the purpose of learning. Students participate in a real activity with real consequences for the purpose of meeting learning objectives. Some experts in the field make the distinction between "democratic experiential education" in which students help design curricula and run their own projects and even do their own grading (through objective contracted standards) and other forms of "experiential education" that put students in existing organizations in inferior roles (such as service learning and internships) or in which faculty design the field work. Experiential learning uses various tools like games, simulations, role plays, stories in classrooms. The experiential learning mindset changes the way the teachers and students view knowledge. Knowledge is no longer just some letters on a page. It becomes active, something that is transacted with in life or life-like situations. It starts to make teachers experience providers, and not just transmitters of the written word. Students become knowledge creators (for themselves) as well as knowledge gatherers. Besides changing student roles, experiential education requires a change in the role of teachers. When students are active learners, their endeavors often take them outside the classroom walls. Because action precedes attempts to synthesize knowledge, teachers generally cannot plan a curriculum unit as a neat, predictable package. Teachers become active learners, too, experimenting together with their students, reflecting upon the learning activities they have designed, and responding to their students' reactions to the activities. In this way, teachers themselves become more active; they come to view themselves as more than just recipients of school district policy and curriculum decisions. As students and teachers take on new roles, the traditional organizational structures of the school also may meet challenges. For example, at the Challenger Middle School in Colorado Springs, Colorado, service activities are an integral part of the academic program. Such nontraditional activities require teachers and administrators to look at traditional practices in new ways. For instance, they may consider reorganizing time blocks. They may also teach research methods by involving students in investigations of the community, rather than restricting research activities to the library. At the University Heights Alternative School in the Bronx, the Project Adventure experiential learning program has led the faculty to adopt an all-day time block as an alternative to the traditional 45-minute periods. The faculty now organizes the curriculum by project instead of by separate disciplines. Schools that promote meaningful student involvement actively engage students as partners in education improvement activities. These young people learn while planning, researching, teaching, and making decisions that affect the entire education system. At the university level, including universities like Stanford and the University of California Berkeley, students are often the initiators of courses and demand more role in changing the curriculum and making it truly responsive to their needs. In some cases, universities have offered alternatives for student-designed faculty approved courses. In other cases, students have formed movements or even their own NGOs like Unseen America Projects, Inc., to promote democratic experiential learning and to design and accredit their own alternative curricula. At first, these new roles and structures may seem unfamiliar and uncomfortable to both students and adults in the school. Traditionally, students have most often been rewarded for competing rather than cooperating with one another. Teachers are not often called upon for collaborative work either. Teaching has traditionally been an activity carried out in isolation from one's peers, behind closed doors. Principals, used to the traditional hierarchical structure of schools, often do not know how to help their teachers constitute self-managed work teams or how to help teachers coach students to work in cooperative teams. The techniques of experiential education can help students and staff adjust to teamwork, an important part of the process of reforming schools. Adventure education is one form of experiential education that is highly effective in developing team and group skills in both students and adults. Initially, groups work to solve problems that are unrelated to the problems in their actual school environment. For example, in a ropes course designed to build the skills required by teamwork, a faculty or student team might work together to get the entire group over a 12-foot wall or through an intricate web of rope. After each challenge in a series of this kind, the group looks at how it functioned as a team. Who took the leadership roles? Did the planning process help or hinder progress? Did people listen to one another in the group and use the strengths of all group members? Did everyone feel that the group was a supportive environment in which they felt comfortable making a contribution and taking risks? The wall or web of rope can becomes a metaphor for the classroom or school environment. While the problems and challenges of the classroom or school are different from the physical challenges of the adventure activity, many skills needed to respond successfully as a team are the same in both settings. These skills — listening, recognizing each other's strengths, and supporting each other through difficulties — can apply equally well to academic problem-solving or to schoolwide improvement efforts. For example, the Kane School in Lawrence, Massachusetts has been using adventure as a tool for school restructuring. The entire faculty — particularly the Faculty Advisory Council, which shares the decisionmaking responsibilities with the principal — has honed group skills through experiential education activities developed by Project Adventure. These skills include open communication, methods of conflict resolution, and mechanisms for decision making. If we asked our students for the highlight of their school careers, most would choose a time when they dedicated themselves to an endeavor of great importance… I am thinking of youngsters from P.S. 321, who have launched a save-the-tree campaign to prevent the oaks outside their school from being cut down. I am thinking of children who write the school newspaper, act in the school play, organize the playground building committee…. On projects such as these, youngsters will work before school, after school, during lunch. Our youngsters want to work hard on endeavors they deem significant. At the professional school level, experiential education is often integrated into curricula in "clinical" courses following the medical school model of "See one, Do one, Teach one" in which students learn by practicing medicine. This approach is now being introduced in other professions in which skills are directly worked into courses to teach every concept (starting with interviewing, listening skills, negotiation, contract writing and advocacy, for example) to larger scale projects in which students run legal aid clinics or community loan programs, write legislation or community development plans. Learning by teaching is integrating behaviorism and cognitivism and offers a coherent frame of theory and practice. Outdoor education happens through organized learning activities occurring in the outdoors, utilizing environmental experiences as a learning tool. Service learning is the combination of community service with stated learning goals, relying on experience as the foundation to provide meaning in service. Cooperative learning alters heterogeneous grouping in order to support diverse learning styles and needs within a group. Active learning, a term popular in US education circles in the 1980s, places the responsibility of learning on learners themselves, requiring their experience in education to inform their process of learning. Environmental education are efforts to educate learners about relationships within the natural environment and how those relationships are interdependent. The experience of being outdoors and learning through doing makes this learning relevant to students. Active learning is an umbrella term that refers to several models of instruction that focus the responsibility of learning on learners. Bonwell popularized this approach to instruction, discussing a variety of methodologies for promoting "active learning." However according to Mayer (2004) strategies like “active learning" developed out of the work of an earlier group of theorists—those promoting discovery learning. Active learning is based on the idea that students who actively engage with the material are more likely to recall information later (Bruner, 1961). However, simple physical interaction as an aid to learning is not well supported by the literature. Rather than being behaviorally active during learning, Mayer suggests learners should be cognitively active. Bonwell and Eison suggested learners work in pairs, discuss materials while role-playing, debate, engage in case study, take part in cooperative learning, or produce short written exercises, and so forth. While it makes sense to use these techniques as a "follow up" exercise, it does not make sense to use them to introduce material. However it is suggested that instructors guide their students during the early stages of learning, and then later, let them practice their new learned skills or apply new information. A class discussion may be held in person or in an online environment. Certainly all would agree that these discussions be held between prepared, knowledgeable participants. A think-pair-share activity is when learners take a minute to ponder the previous lesson, later to discuss it with one or more of their peers, finally to share it with the class as part of a formal discussion. It is during this formal discussion that the instructor should clarify misconceptions. A short written exercise that is often used is the "one minute paper." This is a good way to review materials. While practice is useful to reinforce learning, problem solving is not always suggested. John Sweller suggested solving problems can even have negative influence on learning, instead he suggests that learners should study worked-examples, because this is a more efficient method of schema acquisition. So instructors are cautioned to give learners some basic or initial instruction first, perhaps to be followed up with an activity based upon the above methods. A efficient way to mix guidance and active learning is "Learning by teaching." The students teach the new contents each other. Of course they have to be supported by the teachers very accurately. This method was developed in the early 1980s especially in Germany and is now established for all subjects and all levels in the German educational system. Cooperative education is a structured method of combining academic education with practical work experience. The cooperative model originated when Herman Schneider (1872-1939), engineer, architect, and educator at Lehigh University, concluded that the traditional classroom was insufficient for technical students. Schneider observed that several of the more successful Lehigh graduates had worked to earn money prior to graduation. Gathering data through interviews of employers and graduates, he devised the framework for cooperative education. In 1903 the University of Cincinnati appointed Schneider to their faculty, and later, 1906, allowed him an experimental year to implement his plan. Following that year, the University of Cincinnati gave him full permission for the co-op program. During his thirty years of service to that institution, in which he rose through the rank of Dean of Engineering (1906-1928) to become President (1929-1932), he was an advocate for the co-op framework. His work at the University of Cincinnati is partly credited for that institution's worldwide fame. In 1909, seeing the possibility of co-op education, Northeastern University began using co-op in their engineering program, becoming only the second institution to do so in this country. By 1919, Antioch College had adapted the co-op practices to their liberal arts curricula, for which reason many called co-op the "Antioch Plan." In 1922, Northeastern University emphasized its commitment to co-op by extending it to the College of Business Administration. As new colleges opened at Northeastern, such as the College of Liberal Arts (1935) and College of Education (1953), they became co-op schools as well. By the 1980s, Northeastern was the acknowledged leader in co-op education across the world, a distinction that remained throughout the 1990s. By 1962, about 150 academic institutions used co-op education, in one form or another, many were outside of engineering. The need for professional support of non-engineering programs became obvious, and the membership of ASEE, in 1963, began the Cooperative Education Association. To reflect its membership more accurately, it was eventually named the Cooperative Education and Internship Association, and it remains today as the professional association for co-operative education outside of ASEE. From its beginnings in Cincinnati in 1906, cooperative education has evolved into a program offered at the secondary and postsecondary levels in two predominant models. In one model, students alternate a semester of academic coursework with an equal amount of time in paid employment, repeating this cycle several times until graduation. The parallel method splits the day between school (usually in the morning) and work (afternoon). Thus, like school-to-work (STW), the co-op model includes school-based and work-based learning and, in the best programs, "connecting activities" such as seminars and teacher-coordinator worksite visits. These activities help students explicitly connect work and learning. Co-op's proponents identify benefits for students (including motivation, career clarity, enhanced employability, vocational maturity) and employers (labor force flexibility, recruitment/retention of trained workers, input into curricula) as well as educational institutions and society. Beyond informal and anecdotal evidence, however, a familiar refrain in the literature is the lack of well-done research that empirically demonstrates these benefits. Another set of problems involves perceptions of the field and its marginalization. Because of its "vocational" association, co-op is not regarded as academically legitimate; rather, it is viewed as taking time away from the classroom. Experiential activities are not necessarily rewarded in postsecondary promotion and tenure systems, and co-op faculty may be isolated from other faculty. Despite the current emphasis on contextual learning, work is not recognized as a vehicle for learning. It may be that the field places too much emphasis on placements rather than learning. Wilson also decries the focus on administration, logistics, placements, and procedures. The Community Service Scholarship Program at California State University-Fresno combines cooperative education with service learning. Students receive co-op/internship credit and scholarships for completing a placement at a community service site (Derousi and Sherwood 1997). As in traditional co-op work placements, students get real-world training, opportunities to explore career options, and enhanced employability skills such as communication, problem solving, and leadership as well as awareness of community and social problems. Combining co-op and service learning thus prepares students for roles as workers and citizens. Research on highly successful co-op programs in Cincinnati and at LaGuardia Community College Grubb showed that they share the basic philosophy and fundamental characteristics of the educational strategy of school-to-work. The reconceptualization of co-op should recognize and build upon this connection. At the same time, lessons from successful co-op programs can benefit the broader STW movement. There is a need for broader definition of acceptable models for integrating work and learning. Barton and Wilson identified a variety of work-based learning activities taking different names: co-op, internships, externships, apprenticeship, career academies, and so forth. Work-based learning programs should look for connections and develop collaborative relationships. The alternating and parallel co-op models may not meet the needs of returning adult students and dislocated workers needing retraining. Alternatives such as extended-day programs emphasizing mentoring should be considered. Connecting activities to integrate school- and work-based learning are an essential part of STW. At LaGuardia, the required co-op seminar helps students make connections by giving them a structure within which to reinforce employability skills, examine larger issues about work and society, and undertake the crucial activities of critical reflection. Grubb found that the value of cooperative education is embedded in the culture of the institution (LaGuardia) and the region (Cincinnati). In this supportive culture, employer support does not have to be repeatedly obtained and there are clearly understood long-term expectations on all sides (schools, employers, students). This "informal culture of expectations around work-based learning may be more powerful in the long run than a complex set of regulations and bureaucratic requirements." However, even LaGuardia has found it difficult to sustain co-op culture over time. "The only way in which STW programs can find a permanent place in schools and colleges is for the work-based component to become so central to the educational purposes of the institutions that it becomes as unthinkable to give it up as it would be to abandon math, English, or science." Finn believes that the answer lies in going beyond reconceiving co-op as an "educational strategy, pedagogy, model, methodology, or curriculum." She asserts that it is time for cooperative education to develop and define its body of knowledge, investigate its unique phenomena-for example, the concept of learning from experience, and clarify and strengthen the qualifications of co-op practitioners. For Ricks, cooperative education is inherently committed to improving the economy, people's working lives, and lifelong learning abilities. It can thus position itself to serve the experiential learning needs of students into the twenty-first century. University of Waterloo in Waterloo, Ontario, Canada has the largest co-operative education program in North America, with more than 11,000 students enrolled in co-op programs and more than 3,000 active co-op employers. Northeastern University in Boston, Massachusetts has the largest co-operative education program in the United States of America, and is known as one of the only five-year universities in the United States. Northeastern's Co-Op program has been ranked #1 in the Co-Op and Internships category by U.S. News and World Report. Kettering University in Flint, Michigan enrolls students in co-operative education from their first year on campus, specializing in engineering, science, and management degree programs. One widely adopted form of experiential education is learning through service to others. An example is Project OASES (Occupational and Academic Skills for the Employment of Students) in the Pittsburgh public schools. Eighth graders, identified as potential dropouts, spend three periods a day involved in renovating a homeless shelter as part of a service project carried out within their industrial arts class. Students in programs such as these learn enduring skills such as planning, communicating with a variety of age groups and types of people, and group decisionmaking. In carrying out their activities and in the reflection component afterward, they come to new insights and integrate diverse knowledge from fields such as English, political science, mathematics, and sociology. ↑ C. M. Itin, (1999). Reasserting the Philosophy of Experiential Education as a Vehicle for Change in the 21st Century. The Journal of Experiential Education 22(2): 91-98. ↑ (nd) Experiential learning and experiential education. Wilderdom.com. Retrieved 6/12/07. ↑ (nd) What is experiential education? Association for Experiential Education. Retrieved 6/12/07. ↑ J. Neil, (2005) John Dewey, the Modern Father of Experiential Education. Wilderdom.com. Retrieved 6/12/07. ↑ B.A. Starnes, (1999) "The Foxfire Approach to Teaching and Learning: John Dewey, Experiential Learning, and the Core Practices." ERIC Digests - ED426826. Retrieved 6/12/07. ↑ D.E. Giles, Jr., & J. Eyler, (1994). "Theoretical roots of service learning in John Dewey: Toward a theory of service learning." Michigan Journal of Community Service Learning (Fall): 77-85. Retrieved 6/12/07. ↑ M. Gass, (2003) "Kurt Hahn address 2002 AEE International Conference." Journal of Experiential Education 25(3): 363-371. ↑ A. Bing, (1989) "Peace Studies as Experiential Education." Annals of the American Academy of Political and Social Science 504: 48-60. ↑ D. Kraft, and M. Sakofs, (Eds.) The theory of experiential education. (Boulder, CO: Association for Experiential Education, 1988). ↑ V. Walsh & Golins, G. L. (1976). The exploration of the Outward Bound process. (Denver, CO: Colorado Outward Bound School). ↑ J. McInnerney & T.S. Roberts, (2005). "Collaborative and Cooperative Learning." In The Encyclopedia of Distance Learning, Volume 1: Online Learning and Technologies. (Hershey, PA: Information Science Publishing), 269-276. ↑ 23.0 23.1 23.2 C. Bonwell, and J. Eison, (1991) Active Learning: Creating Excitement in the Classroom. (Washington, DC: Jossey-Bass). ↑ J.A. Palmer. (1998) Environmental Education in the 21st Century: Theory, Practice, Progress, and Promise. (New York: Routledge). ↑ 28.0 28.1 28.2 J. W. Wilson, W. A. Stull, and J. Vinsonhaler, "Rethinking Cooperative Education." Journal of Cooperative Education 31 (2-3) (Winter-Spring 1996): 154-165. ↑ 29.0 29.1 C. Crow, "Cooperative Education in the New Millennium." Cooperative Education Experience. (Columbia, MD: Cooperative Education Association, 1997), 1-5. ↑ 30.0 30.1 F. Ricks, "Principles for Structuring Cooperative Education Programs." Journal of Cooperative Education 31 (2-3) (Winter-Spring 1996): 8-22. ↑ K. L. Finn, "The Spaces Between: Toward a New Paradigm for Cooperative Education." Journal of Cooperative Education 32 (2) (Winter 1997): 36-45. Auld, R. B. "The Cooperative Education Movement: Association of Cooperative Colleges." Journal of Cooperative Education 8 (1972): 24-27 ISSN: 0022-0132. Barton, P. E. Cooperative Education in High School: Promise and Neglect. Princeton, NJ: Educational Testing Service, 1996. Bruner, J. S. 1961. "The act of discovery" Harvard Educational Review 31 (1): 21–32. Calkins, L. 1991. Living between the lines. Portsmouth, NH: Heinemann Educational Books, Inc.
Carlson, A. "Co-op Planet: Organizations at N.U. Plant Co-op's Seeds Far and Wide." Northeastern University Magazine. Boston, MA: Northeastern University (Office of University Relations). May 1992. Crow, C. "Cooperative Education in the New Millennium." Cooperative Education Experience (1997): 1-5. Columbia, MD: Cooperative Education Association. Derousi, P. and C. S. Sherwood. "Community Service Scholarships: Combining Cooperative Education with Service Learning." Journal of Cooperative Education 33 (1) (Fall 1997): 46-54. Educational Writers Association. 1990. "Lawrence grows its own leaders." High Strides: Bimonthly Report on Urban Middle Grades 2 (12). Washington, DC. Finn, K. L. "The Spaces Between: Toward a New Paradigm for Cooperative Education." Journal of Cooperative Education 32 (2) (Winter 1997): 36-45. Furco, A. "Service Learning and School-to-Work." Journal of Cooperative Education 32 (1) (Fall 1996): 7-14. Grubb, W. N., and N. Badway. Linking School-Based and Work-Based Learning: The Implications of LaGuardia's Co-op Seminars for School-to-Work Programs. Berkeley, CA: National Center for Research in Vocational Education, 1998. Grubb, W. N., and J. C. Villeneuve. Co-operative Education in Cincinnati. Berkeley, CA: National Center for Research in Vocational Education, 1995. John, J. E. A., D. J. Doherty, and R. M. Nichols. "Challenges and Opportunities for Cooperative Education." Journal of Cooperative Education 33 (2) (Winter 1998): 10-16. Kielsmeier, J. & R. Willits. 1989. Growing Hope: A Sourcebook on Integrating Youth Service into the Curriculum. St. Paul, MN: National Youth Leadership Council, University of Minnesota. Kirschner, P. A., J. Sweller, and R. E. Clark. 2006. "Why minimal guidance during instruction does not work: an analysis of the failure of constructivist, discovery, problem-based, experiential, and inquiry-based teaching" Educational Psychologist 41 (2): 75-86. Kraft, D. & M. Sakofs, Eds. 1988. The Theory of Experiential Education. Boulder, CO: Association for Experiential Education. Mayer, R. 2004. "Should there be a three-strikes rule against pure discovery learning? The case for guided methods of instruction" American Psychologist 59 (1): 14-19. Ricks, F. "Principles for Structuring Cooperative Education Programs." Journal of Cooperative Education 31 (2-3) (Winter-Spring 1996): 8-22. Ricks, F., J. Cutt, G. Branton, M. Loken, and G. Van Gyn. "Reflections on the Cooperative Education Literature." Journal of Cooperative Education 29 (1) (Fall 1993): 6-23. Rolzinski, C. 1990. The Adventure of Adolescence: Middle School Students and Community Service. Washington, DC: Youth Service America. Schaafsma, H. "Reflections of a Visiting Co-op Practitioner." Journal of Cooperative Education 31 (2-3) (Winter-Spring 1996): 83-100. Smollins, J. P. "The Making of the History: Ninety Years of Northeastern Co-op." Northeastern University Magazine (May 1999). Boston, MA: Northeastern University (Office of University Relations). Sweller, J. 1988. "Cognitive load during problem solving: Effects on learning" Cognitive Science 12 (1): 257-285. Sweller, J., & G. A. Cooper. 1985. "The use of worked examples as a substitute for problem solving in learning algebra" Cognition and Instruction 2 (1): 59-89. Changing Schools through Experiential Education. ERIC Digest. Improving Evaluation in Experiential Education. ERIC Digest. Active Learning: Creating Excitement in the Classroom. ERIC Digest. The original version of this article is from this public domain site. New Directions for Cooperative Education. ERIC Digest. Cooperative Education and Internship Association (CEIA). Theosophy, Vol. 43, No. 5, March, 1955 (Pages 218-225) Intuitive Educators: Herman Schneider 1872—1939. This page was last modified on 9 August 2017, at 17:54.